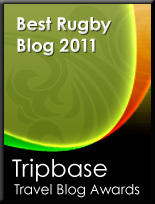 TOTAL FLANKER...a rugby blog: Team of the Year? The winning of the BBC Sport Team of the Year award by the England rugby team at last night's event just goes to show what a poor year in general it has been for British sport, and in particular for the team sports. Don't get me wrong, England's progress to the Rugby World Cup final was, when set in the context of what went before, somewhat miraculous - but to to give them an award for Team of the Year for, effectively, two performances (against Australia in the quarter final and against France in the semi final) is just plain wrong and Martin Corry and the rest of the players looked suitably embarrassed when receiving the trophy. No arguments from me, though, about boxer Joe Calzaghe taking the BBC Sports Personality of the Year award.